This weekend marked the first full weekend of the Pace Podcast Equinox to Equinox Rally (E2E). As luck would have it, I had the whole day to myself on Saturday so – I went riding. The Empire State has a long history of being… histor… i..cal.. ? Right. New York is jam packed to the gills with American history. Lots of rich, important, famous and Presidential-type people have lived in, slept in, fought, died and vacationed in the great state of New York. Do you know what that means? Lots and lots of potential bonus points. When I looked through the E2E bonus list, aside from their point values some of the categories generally appealed to me for different reasons. The big dog on the list for me was “Presidential Library.” Do we have one of those around here? No. Well, actually, sort of. When I Googled a list of Presidential Libraries I discovered that there are only 13 of them. Wouldn’t you know it? New York has one. Good ole FDR. And as it turned out, it was easily reachable considering I had the whole day free to ride. Yay! Hyde Park, NY was my focus for the day. If I picked up that stop and nothing else that would have been fine with me. I would get out for a ride, enjoy the sunshine and earn at least 10 points. After getting off of Long Island and into Westchester, I made a quick stop at the lovely green-eyed Muffler Man in Elmsford. As I stood there taking a picture I heard the sound of a car horn honking. I turned and looked but the early morning sun glared in my eyes so I quickly turned away when it became apparent I wasn’t about to be mowed down by a car. This time when I turned I was able to see my two friends Pete & Edyta waving at me from their truck. Whattheheck?! Since I was in the neighborhood before continuing on to Hyde Park, I stopped in to Sleepy Hollow, NY. Yes, the town made famous by Washington Irving’s and The Legend of the Sleepy Hollow. 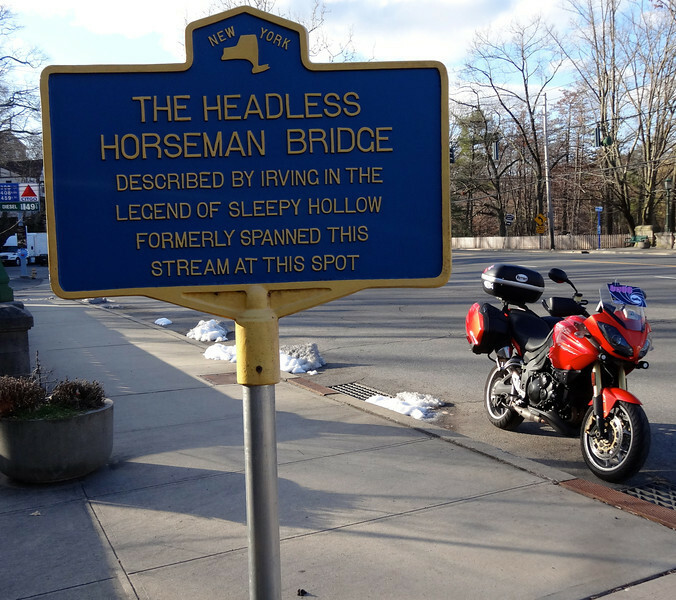 Having passed through the area several times before, I knew there were quite a few historical markers around but I specifically wanted to get the Headless Horseman Bridge marker. I took some time to go through the Sleepy Hollow Cemetery. There are some lovely old mausoleums, headstones and grave markers all throughout the grounds. Seeing that it was arrowed on the cemetery roadway, I followed the route to the Irving family burial area. I also took a picture of the Old Dutch Church. But, as I noted on my rally flag post you should never underestimate your ability to forget something simple. I took a picture of the Old Dutch Church with my bike and flag and even the church sign which features the year it was built (1685). But… not the church’s historical marker :-/ So I didn’t submit that one for points. Duh. The rally rules say that only 1 picture can be submitted for each bonus stop. I’ve found that at times it can be difficult to get the bike, the flag, the bonus ‘thing’ in to a photo and have something like a marker or a date on a stone be readable. I bungled a handful of snaps this weekend that I opted not to submit. I suspect over time I’ll learn some tricks to get all of the required info in without so much fumbling around. By the time I’d made it to Hyde Park to pick up the one bonus I really wanted – the Presidential library, I’d probably already stopped 5 or 6 other times. Once in Hyde Park, the stops came fast and furious – A Vanderbilt here, a Roosevelt there. And then just like that… I’d done what I wanted to do. 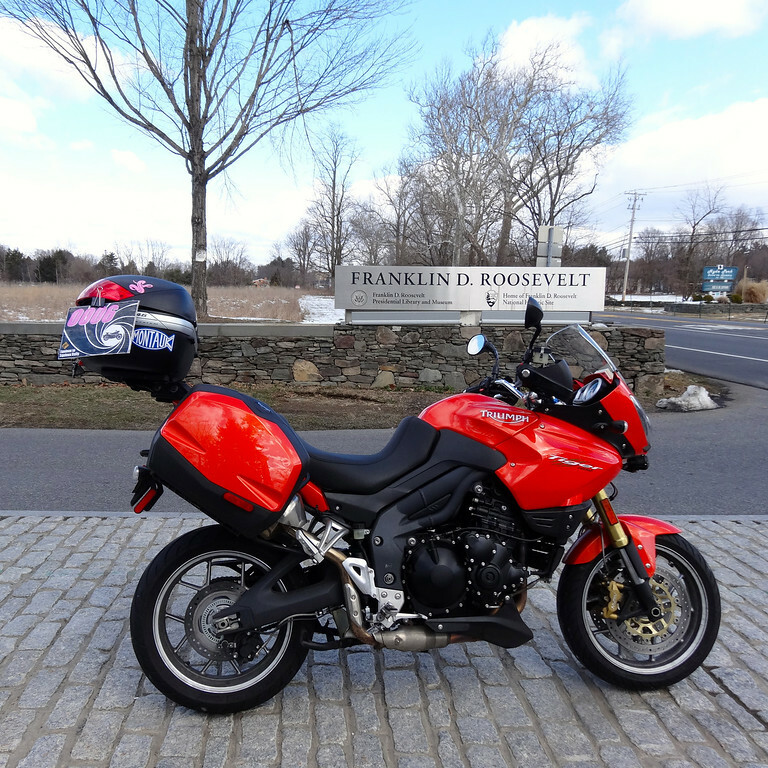 I put my mind on cruise control and rode past historical markers, town halls, firehouses, post offices, and police stations because I just didn’t feel like stopping. 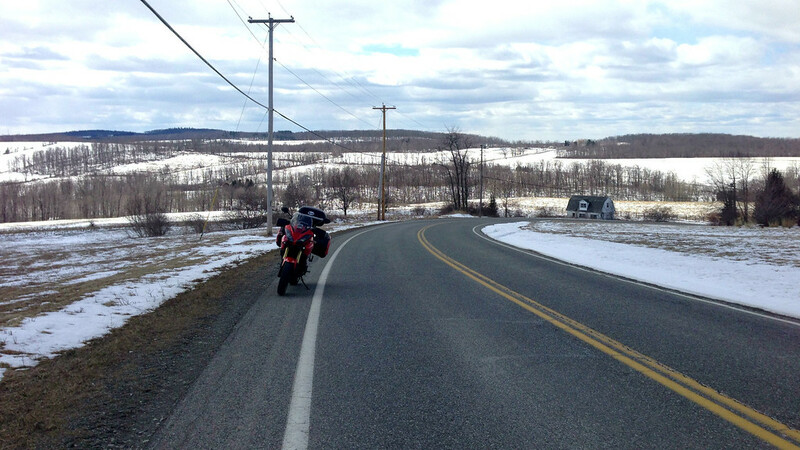 The roads were in good shape, the sun was out and I just felt like riding. I spent the rest of the afternoon just riding along, stopping for things that crossed my path but not really working hard to navigate to anything in particular. There were some really good finds that just happened to be along my route – the giant 8 ball, the turtle rock, a big cow in someone’s yard. 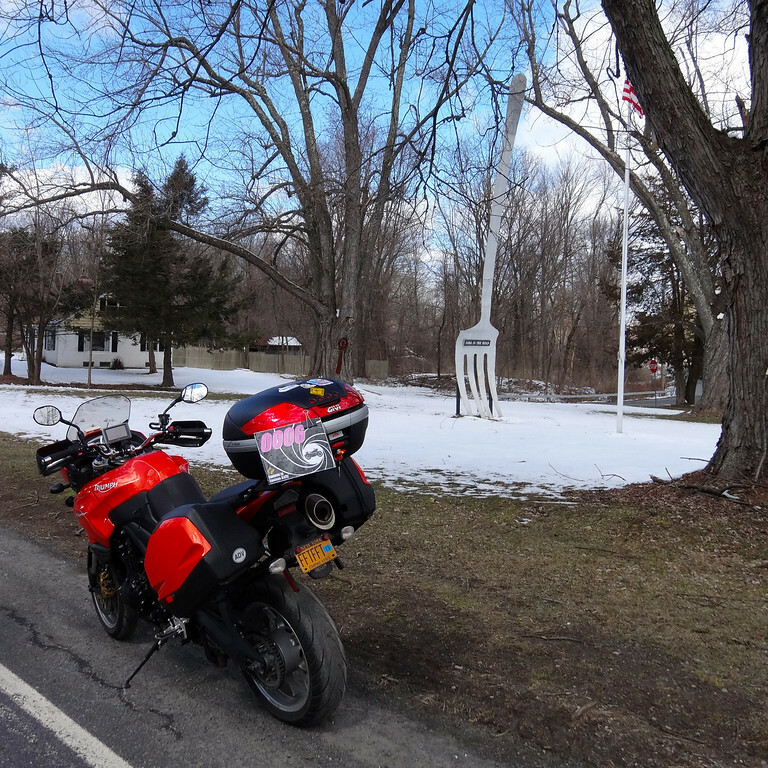 I just kept chugging along, heading south through Connecticut towards Long Island – picking up bonuses along the way. I submitted 34 pictures this week. More than I anticipated considering I just had my mind set on the FDR Library. But, NY is a historical and weird place. 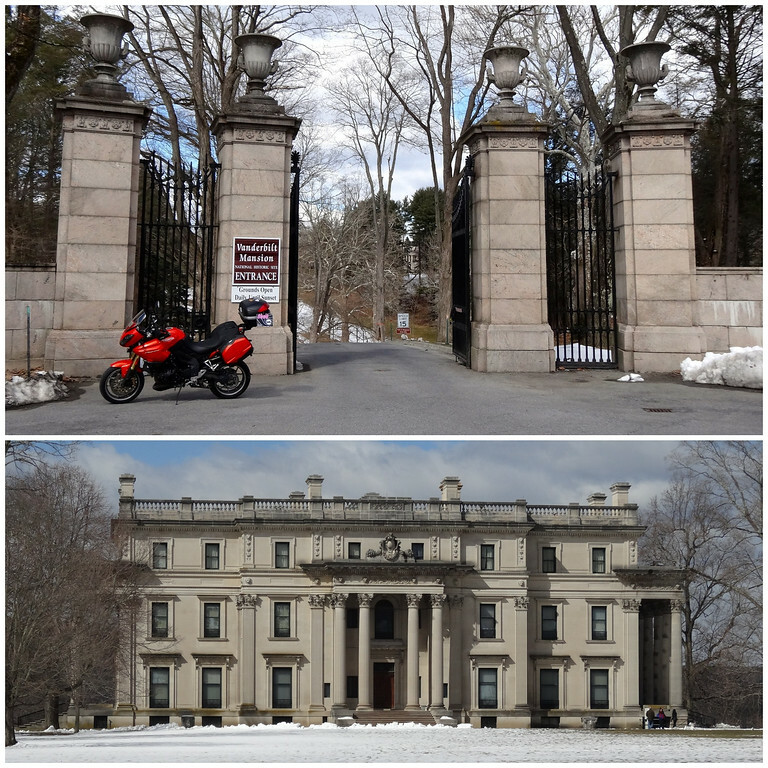 There is no shortage of things to see and places to stop even of I never left Long Island. I wonder what I’ll be able to pick up in my travels when the days are long and the weather warms up? Riding around looking at things – it’s what I do all the time. That makes these types of rallies a comfortable fit for me. When I’m making a concerted effort to find something or really take my time to look, read and observe something – it makes the ride that much more of a good experience for me. 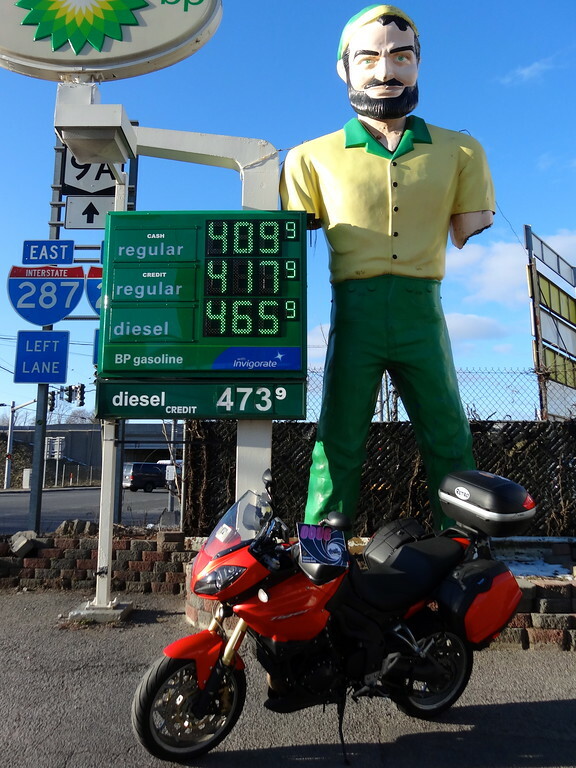 Ride your motorcycle, learn stuff and see cool roadside statues. What could be better? I have no doubt that the leaderboard will be very fluid. I’m in, purely as an excuse to have to do something with the benefit of it having to be on a moto. Nice, Daniel 🙂 Any excuse to ride is alright. 34 just this week? Wow. Simply wow. It’s a long haul…so enjoy the lead now Fuzzy! You got a lot of riders on your tail that are hungry for victory! I lost one of my gloves at Sleepy Hollow about 5 years ago. I firmly believe it disappeared into another dimension. Hyde Park has been on my “to-do” list for a long time and I’ve been over, under, and on both sides of it a number of times but I still haven’t checked it off yet. …and keep fotographiing and inform us regularly!